The students, staff and volunteers at the Red River Area Learning Center in Moorhead wanted to showcase their talents to the larger Moorhead community. 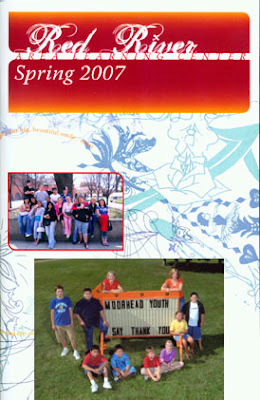 The school worked with the Moorhead Healthy Community Initiative to secure a $500 award from West Central Initiative's "Do Something" grant to produce the first ever literary and arts magazine for the Red River Area Learning Center (cover pictured, along with a "thank you" photo card received by WCI). The process was just as important as the outcome--perhaps more so. The 16 students were invited to spend a day on the Minnesota State University Moorhead campus creating poetry, stories and artwork and experiencing campus life. A month later, they were the guests of honor at a luncheon attended by 30 of Moorhead's community leaders. They read from the magazine and shared their thoughts about the experience. The event even made it on the local 6 p.m. news.